10 ways to cut your costs at university - Which? But even with this, your income may not quite match your outgoings (particularly rent, bills and study expenses not covered by your tuition fees). See what students spent on these on average, or try our student budget calculator to get a breakdown of your living costs tailored to your university. If that’s the case, you’ll need to pull out a few tricks to make ends meet. Fortunately, some recent students have kindly shared their tried-and-tested money tips to cut your costs as a student. The following tips come from our annual survey. See which universities students rated top for nightlife, student union and more. The sooner you get an idea of your weekly routine, the sooner you can decide whether to buy a weekly, monthly or even termly travel ticket to get around at uni. This is nearly always the cheaper option than buying individual single tickets. See more about this below. Also, think about how often you plan to visit home. If you’re going to get the train or coach when you do, a student railcard can greatly reduce this cost. The same goes if you’ll be travelling to any placements as part of your course (check if there is any support available to specifically subsidise transport costs for this). You’ll no doubt be presented with a long list of books that you’ll need to buy as part of your course. Most tutors will insist you buy them all, but it might be worth checking how many are mandatory (and how many are nice-to-haves). You don’t want to spend loads on something that will just gather dust on your shelf. Find out if any necessary books are available in your library to borrow, or if the relevant bits are available online for free to download. This is a great tip, but be careful: campus shops are best saved for convenience purchases (ie if you have a sugar craving or need something quick), rather than your entire food shop. Find out what supermarkets are in your local area. Our city guides include student comments on what amenities are available in the local area. Shop around for the best deal on different items. Some supermarkets may offer to match the price if you find an item cheaper elsewhere. You’ll soon discover which clubs and bars run their big student nights in the week. Weekends are often more expensive and busier, as this is when non-students go out too. Sometimes you can get in free or for less if you put your name on a guestlist or arrive before midnight. Don’t be afraid to suggest an evening in with a film if money is tight or you’re just not all that up to it. There will nearly always be another time to go out. This only really applies to those who are renting privately - if you live in halls, energy will already be factored into your accommodation cost. Think about ways you could reduce energy use for cheaper bills, such as cooking with housemates or putting on a jumper rather than ramping up your thermostat. 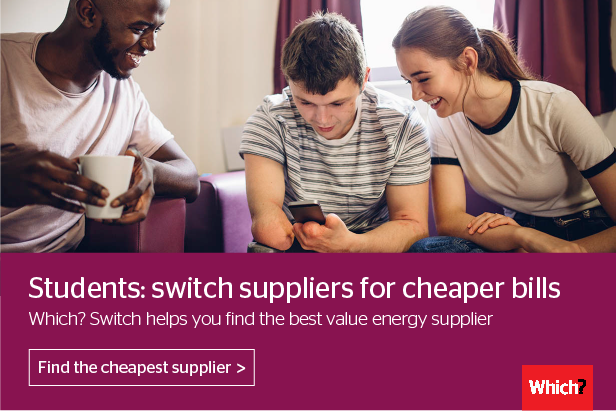 We'd also recommend shopping around for a good-value energy supplier and switching to them, so long as you're allowed (check with your landlord, or take a look at your tenancy agreement if you're not sure). Find out more by heading to Which? Switch. You’d be surprised what opportunities are out there for students to earn some easy money (completely legally and above board of course!). These aren’t necessarily your typical retail or waiting jobs either! These might involve answering some quick questions online for small amounts at a time, which can add up quite nicely. But be wary of any ads that look too good to be true. If you’re unsure, run it by your university’s student services. It could be a scam preying on naive students overly keen to make a quick buck! You may also find ads around campus posted by students looking for participants in experiments or studies, as part of their course. Don’t be put off by the scary word ‘experiment’. These aren’t necessarily the medical kind you see at the start of gory zombie movies. It might just boil down to a scenario where you try to perform a task and you’re observed while doing so – no needles or elecotruction involved at all! Try to plan your meals for a week and stick to a shopping list, rather than do your shop on an empty stomach. If you go in unprepared and hungry, you’re more likely to make impulse purchases, be swayed by a supposed ‘deal’, or buy too much of something (that will end up going to waste). There may be some items you can split the cost of with housemates if you’re all likely to use it, such as milk or bread. It saves you all buying the exact same items, which all go out of date at the same time. You might want to buy certain items that don’t have an immediate expiry date in bulk (eg rice) or household items such as toilet paper, as this can be cheaper in the long-run. Cooking is also a great way to bond with your new housemates, too. This applies to restaurants, shops, exhibitions, museums and other events. Don’t be intimidated or feel like you’re being cheap by asking – it’s widely recognised that students aren’t exactly rolling in money. When paying for tickets online, check if they offer a student discount too. Note, you might need to take your NUS card or student ID to the event as proof. If you’re studying in a small city or town, you might not have to rely on public transport so much. You may be able to get by on foot or by bike – both excellent and simple forms of exercise. Again, it really depends on your comings and goings. In first year when you live on campus, this will depend on how often you plan to go into town for nights out or for a part-time job. How far you need to travel (and your costs) may go up suddenly in second year, if you move off campus and rent a house or flat in town. Keep this in mind when discussing with your future housemates where you want to live. Sure, being in the heart of town will make journeys home from nights out easier, but you’ll still need to get to campus most days for classes. Check out our guide to choosing the right student city, or browse our city guides to learn more about the most popular student cities (including things to do and the best areas to live in).